Trying to decipher handwritten records can cause intense frustration, not to mention brutal eyestrain. Fortunately, it does get easier with practice! Prior to the 20th century, most people used a style of handwriting called "copperplate," which was invented in England in the 16th century as an alternative to calligraphy for business records and official documents. Traditional calligraphy is very time-consuming to write because the pen has to be repeatedly lifted off the paper. Calligraphy was fine for monks in the Middle Ages, but in the furious Age of Commerce, an alternative was needed. Copperplate filled the need for quick and efficient paperwork. The name "copperplate" comes from the copper engravings which were used to print writing manuals ("copybooks"). 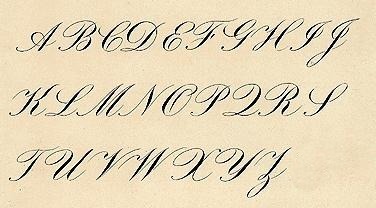 Eventually, many styles of copperplate script were developed, some quite simple, some highly ornate with generous loops and flourishes. Different copybooks were published for particular occupations, genders, and social classes. The result was a great deal of variation in handwriting styles based on individual history and preference. Capital "L" and "S" are hard to tell apart, especially in unfamiliar names. Capital "I" and "J" are often indistinguishable. Double-s may look like "fs" or even "ps". Decorative loops and flourishes can mimic other letters such as small "e". If you have trouble deciphering a name in an old document, compare the letters to other words that are easier to read. Keep in mind that names may be spelled in unusual ways (spelling is very inconsistent in old records). If the name still seems very strange, check a Bible dictionary. Although most people had ordinary names like John and Mary, you may occasionally come across an obscure Biblical name like Keturah, Vashti, or even Pharoah (spelled Faro in one case I've seen). In some old documents, "th" is written as "y". For example, "Anne Smith ye wife of John died April ye 1st 1654." The "y" is actually an old Germanic rune called the "thorn" (þ). The Latin alphabet has no letter for "th," so Medieval scholars used the thorn instead, which looks very much like a "y" when written in caligraphy. It was pronounced with the normal "th" sound. The following table is taken from 19th century North Carolina census records, and shows some of the variations in copperplate handwriting.